North Star Cruises has appointed PEPR Publicity to manage Australian media relations for their ‘destination experience’ the adventure cruise ship, TRUE NORTH. PEPR Publicity Director Philip Engelberts and Account Manager Laura Speirs will oversee the account, with their credentials including over 15 years in tourism PR each. PEPR will roll out a pro-active PR program of media and stakeholder relations. TRUE NORTH is one of Australia’s most esteemed and revered tourism products. Cruise onboard TRUE NORTH are activity based and access some of the most remote and unspoilt coastal areas of Australia and Papua New Guinea with itineraries ranging from 4-13 days. 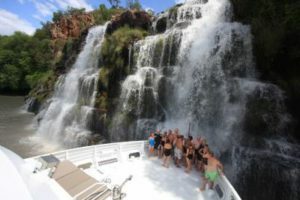 TRUE NORTH’s flagship ‘Kimberley Wildness Cruise’ is a 6 or 13 day expedition exploring the area’s spectacular gorges, waterfalls, islands and rugged coastline. Daily activities include scenic walks, fishing, snorkelling, diving, picnics and helicopter flights. All shore excursions are accessed via TRUE NORTH’s fleet of expedition boats and onboard helicopter. Style, comfort and exceptional food and wine are at the heart of a TRUE NORTH experience, with an all Australian crew of 20 servicing the needs of a maximum 36 guests. All cabins feature modern décor, ensuites and entertainment facilities, while other onboard facilities include an observation lounge, sundeck and alfresco bar. Modern Australian cuisine prepared with locally sourced seasonal ingredients is complimented by TRUE NORTH’S outstanding WA wine selection.